In Pablo Picasso’s iconic Cubist masterpiece “Three Musicians,” the Spanish painter constructs a joyous geometric collage portraying himself and two close friends as a carnivalesque combo. 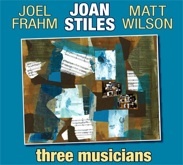 On pianist Joan Stiles’s consistently inspired new CD Three Musicians, she’s created an equally vivid portrait of bold artists in action, a captivating aural collage full of witty, often jaw-dropping juxtapositions (she’s also responsible for the CD’s smart cover art, a Picasso homage-collage). Her first two albums showcased Stiles as a resourceful and inventive arranger. With its stripped-down instrumentation, Three Musicians reveals the pianist as a madcap seat-of-the-pants improviser who combines vast harmonic resources and rhythmic acuity with a pleasingly sharp sense of humor. The unusual trio features saxophonist Joel Frahm and drummer Matt Wilson, superlative musicians who share Stiles’s prodigious sense of play. The lack of a bassist was the key to the open and unfettered sound that she was after. Stiles occasionally plays a walking left-hand bass line, but the musicians each take responsibility for filling in the low end and for maintaining the oft-shifting pulse. Tackling a fascinating array of material, she keeps each piece concise and focused, even while introducing a steady flow of incisive quotes and quicksilver rhythmic feints. The album opens with Mama Rose’s ironic showstopper “Everything’s Coming Up Roses,” from Stephen Sondheim and Jule Styne’s Gypsy. Inspired by a recent Broadway production starring Patti LuPone, Stiles turns up the heat with a few unmistakable bars of “Pent Up House,” capturing the song’s essence as a fierce survivor’s pep talk to herself. Nothing better demonstrates Stiles’s crazy-like-a-fox approach than the portmanteau construction of Cream’s “The Sunshine of Your Love” and Richard Rodgers’s “My Funny Valentine” with a Bach fugue eased in as musical mortar. The trio works similar magic on the financial meltdown medley of “Brother, Can You Spare a Dime?” and the Beatles’ “Can’t Buy Me Love,” which moves seamlessly from the desperate to the beatific. With Stiles, tunes are rarely what they first appear to be. On a ballad rendition of Leonard Bernstein’s “Lucky to Be Me,” she references a handful of the Maestro’s other love songs while Frahm sticks to the original melody. The loosey-goosey sax/piano duo’s romp through Jerome Kern’s “All the Things You Are” finds new ideas in the oft-covered standard, while the version of Monk’s “Nutty” fully embraces the title as the trio scrambles this way and that through the tune’s rhythmic thickets. Which isn’t to say that they can’t keep a straight face. Stiles and Frahm slow down Billy Strayhorn’s beautiful “Blood Count,” turning the soaring melody into a sinuously introspective meditation. The duo digs into “O.W.,” a coruscating blues by Mary Lou Williams, who has long been a primary source of inspiration for Stiles. “Bebopicity,” an original, closes the album with a blazing bop workout that highlights the trio’s lightning reflexes within a heightened sense of time that allows them to take the music in any direction. A jazz artist doesn’t create an unorthodox album like Three Musicians without a deep well of experiences to draw upon. Joan Stiles has taken a long, circuitous route to becoming one of jazz’s most inventive pianists and bandleaders. Born and raised in Brooklyn, she gravitated to a converted player piano in her grandmother’s Greenpoint apartment, picking out TV commercial themes “by ear.” Encouraged by her father, an amateur singer, she quickly learned how to read lead sheets, improvise, and accompany him singing standards. In her early teens, she found a creative outlet as a guitar-wielding singer/songwriter who performed around Brooklyn. Later on as a precocious 17-year-old college sophomore, she dropped out of NYU to join a rock band as a keyboardist and vocalist. After starting a family, while still in her early 20s, Stiles went back to school studying European classical music and working as a vocal accompanist on piano and harpsichord. By the mid-’80s, she was a classical theory major in graduate school, teaching at Brooklyn College, and becoming increasingly more passionate about jazz. 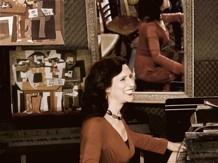 In 1986, Stiles formally shifted her academic focus from classical to jazz, and earned an M.M. degree from the Manhattan School of Music, studying with Harold Danko. She suffered a dramatic setback in 1988 after slipping on a wet cellar door and smashing her left wrist to pieces. Following surgery and rehabilitation, she played her first NYC trio gigs in 1990 and learned the bandleading ropes through trial and error. But none of her previous experience really prepared her for her debut album, 2004’s Love Call (Zoho). Widely hailed as one of the year’s best releases, Love Call is the work of a wildly ambitious artist stretching herself to the utmost. Featuring a cast of veteran masters, including trumpeter Clark Terry, tenor saxophonist Frank Wess, reed expert Jerry Dodgion, baritone saxophonist Joe Temperley, trombonist Benny Powell, and trumpeter Warren Vaché, the album features her octet arrangements of American Songbook standards and jazz classics. At Manhattan School, she had audited an arranging class with David Berger, and ended up using two of her student charts on the audacious debut recording. She lined up the stellar players one at a time, knowing that the cats relished the opportunity to play in a horn section together. If Love Call grounded Stiles in the musical language of the post-World War II big bands, Hurly-Burly put her in the thick of the progressive mainstream action. The album evolved out of her ongoing efforts to spotlight the genius of Mary Lou Williams, the pianist, composer, and arranger who “played through all the eras” and helped lay the foundation for bebop. She composed the sextet charts with Jeremy Pelt, Steve Wilson, and Joel Frahm in mind. What’s striking about Stiles is that she’s not beholden to any one era or jazz piano style. Her immersion in Mary Lou Williams’s work has opened up jazz’s fabulously rich but often neglected history, from the 1920s to today. Hurly-Burly self-consciously explores the piano tradition, as Stiles doesn’t just play Fats Waller’s “Jitterbug Waltz,” she evokes his fleet, two-handed style too. She takes a similar approach to Ellington, Monk, Mary Lou Williams, and Jimmy Rowles. With Three Musicians Stiles is looking squarely to the future, making music that’s as fresh and full of wondrous surprises as any artist on the scene.